Errol Morris’ The Fog of War was a direct and memorable document of the open and regretful remiscences of Robert McNamara, the aged former U.S. Secretary of Defense who presided over the fateful, doomed escalation of the Vietnam War under the Kennedy and Johnson Administrations in the 1960s. McNamara knew that the war was wrong when he spoke to Morris for the film, and is shown talking through his guilt over the decisions that made it happen. What was most galvanizing about The Fog of War, most challenging and compelling in the film, was McNamara’s assurance that consciencious, informed rationality was not the panacea for destructive conflict but could often be its proximal cause. Even the best data, the most expert assessments, the most careful and deliberate of actions can lead to billions of dollars being spent to achieve thousands of deaths for doubtful ends. The most unforgettable and unsettling of his subtitular eleven lessons was “Rationality will not save us”. The Unknown Known is The Fog of War‘s equally well-crafted but much less satisfying and much more ambiguous sequel. Morris’ subject this time is a subsequent Secretary of Defense who was the architect of a subsequent morally suspect, financially wasteful, and needlessly deadly American war: Donald Rumsfeld, under whose watch the United States invaded Iraq, toppled Saddam Hussein, and unleashed an unstable quagmire of a situation in Mesopotamia that is no closer to effecting positive change in the Middle East region a dozen years after the Bush Administration went to war with that ostensible goal in mind. As is perhaps appropriate to the still-unresolved conflict that he ran and that eventually ran him out of the Pentagon, Rumsfeld offers no clear answers, no McNamara-esque numeric list of bullet-point lessons that he learned from his unwise and unjust war. The Unknown Known suggests that Rumsfeld might not have learned anything at all beyond a wealth of new ways to manipulate language and meanings in the service of ideological propaganda. McNamara was prepared to face up to hard truths; Rumsfeld is prepared to face the challenge of evading the condemnation of reality with grimly amused anticipation. Morris includes excerpts of government memos written by his subject, as well as clips of his legendary Pentagon news conferences. This supplemental material doesn’t so much expand on Rumsfeld’s interviews with Morris (unnervingly looking into the camera, right at the audience) as parry with them, probing for a weak spot in his impeccable facade of dissembling semantics to land a argumentative blow. Morris finds a few gaps in the armour near the end of the film, including Rumsfeld’s acknowledgement of his own misjudgement and hypocrisy that disarms with its unexpected simplicity. But The Unknown Known is not well-served by this sort of “gotcha!” documentary journalism, and does not dwell on them overlong. The film’s title stems from Rumsfeld’s best-known press conference epistemological definition during the Iraq War period. 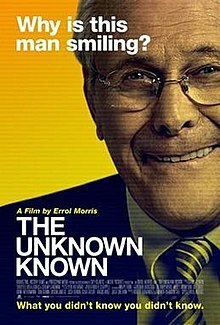 Slavoj Zizek added this final, ideologically-tilted formulation to those detailed by Rumsfeld, and Morris shows the former Secretary of Defense considering the possibilities of “the unknown known” at the conclusion of his film about the stateman’s life and achievements. It’s a moment of odd philosophical convergence that focuses on an ill-acknowledged point about the American neoconservative elite of which Donald Rumsfeld has long been a major figure. Conservative intellectuals are frequently fretting over the shocking, irresponsible moral relativism and non-realist absorption in the terms and concepts of political correctness, anti-discrimination, and cultural tolerance that characterizes the rhetoric of their counterparts on the academic left. Zizek, indeed, is a favoured target of such critiques. Yet it is neoconservatism, fundamentally grounded in disseminating grand lies to the populace “for their own good”, that substitutes elaborately constructed fantasies for concrete, complicated realities. What, after all, is an “unknown unknown” in Rumsfeld’s delineation but a garbled Orwellian euphemism for a fevered fantasy, an invention of the paranoid imagination? Watching Donald Rumsfeld in The Unknown Known, repeatedly retreating to semantics and terminological pedantry when confronted with intractable problems at least partly of his own making and indeed study up for each time that he must do so, makes this right-wing intellectual projection stand out all the more starkly. The inherent paucity of his belief-system of choice when it comes to accruing tangible, positive real-world results is the core “unknown known” lurking unacknowledged in Rumsfeld’s reality. Errol Morris’ film does its best to make this case, but its subject will be damned if he will be dragged kicking and screaming into any admission of its truth.